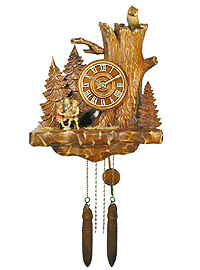 Cuckoo Clock with Quarz-Movement (battery operated). 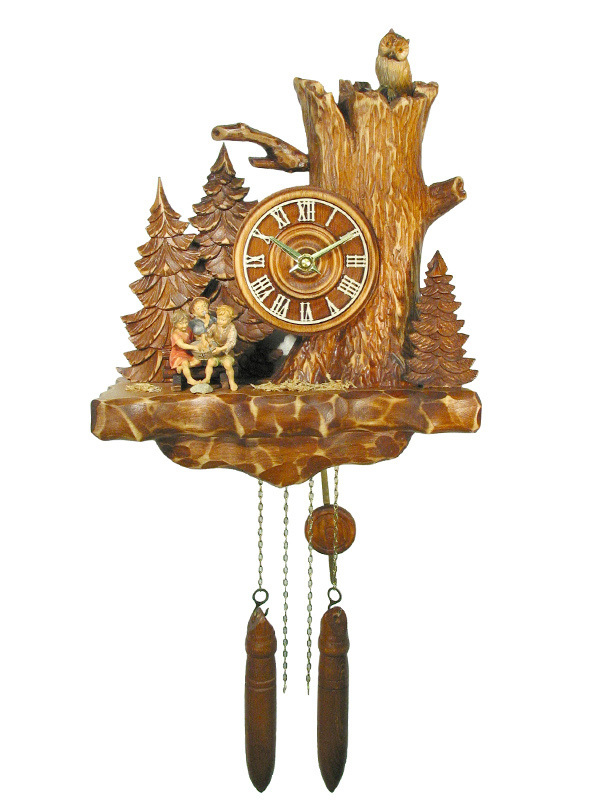 This is a very unusual cuckoo clock from the new Old Oak Line of August Schwer Cuckoo Clocks. The cuckoo clocks of the Old Oak Line are an entirely new interpretation of the classic cuckoo clock theme. The clocks present the cuckoo clock in a new physical form. All clocks are built by hand, the complete base of the clock and the massive oak tree trunk on the clock are hand-carved here in the Black Forest. Decoration and figurines are also handmade and handpainted. (All clocks / decoration variants are available as wall clock or as table / mantle clock). This clock has a battery operated quarz movement. This movement is made in Germany. The cuckoo call is at the full hour. The number of cuckoo calls indicated the hour. The clock has a swinging pendulum, made of wood. The weights on the clock are also made of wood; they do not move. Size of the clock: 13.4 inches tall (measured without weights or pendulum), 11 inches wide, 4.3 inches deep. made by August Schwer Cuckoo Clock Factory, Schoenwald, Black Forest.